Oftentimes when I'm looking through a new cookbook or magazine, a recipe will jump out at me and I must. Make. Immediately. Such was the case with these risotto-stuffed peppers.... except it's been 8 months since I first saw this recipe (you know, things happen. Like giving birth to twins). 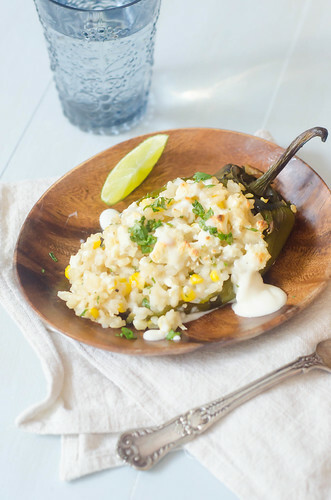 Corn, risotto, and roasted poblano peppers are some of my favorite foods, throw in Mexican beer, cilantro, and plenty of cheese, and it was a foregone conclusion that I'd love this dish. There is really nothing like sweet summer corn. It's truly one of the best foods in the world - while the recipe gives the option of fresh or frozen corn, using fresh corn at the height of the season really sets this meal apart. I made this when we had our best friends over for dinner one night, and it was a great meal for entertaining - I roasted and prepped the peppers early in the afternoon, then just made the risotto and stuffed the peppers while we hung out in the kitchen chatting and snacking on chips, salsa, and guacamole. I had actually planned to totally prep it ahead of time, cover, and refrigerate, but as it often does these days, the afternoon just got away from me. This was a fun spin on stuffed peppers - the poblano provided a good amount of heat, and the creamy, sweet risotto was the perfect counterpart. I loved the crumbled cheese on top, and the whole thing was finished with a drizzle of lime crema. I only made 4-5 peppers, so I just baked the remaining risotto in a small casserole dish for the kids (and subsequently for the adults who wanted seconds). It worked out really well since the poblanos I used were actually quite spicy. If you're someone who refuses to turn on your oven in the summertime, I urge you to make an exception for this recipe - it's totally worth it! Preheat the broiler and arrange the peppers in a single layer on a baking sheet. Broil, turning every few minutes, until the peppers are charred and blistered all over. Transfer to a glass bowl, cover with plastic wrap, and set aside for 10 minutes. When the peppers are cool enough to handle, gently rub off the skins, and cut a slit lengthwise in each chile. Carefully scrape out the seeds and ribs (leave some in for a bit more spice). Set the peppers aside while you make the risotto. To make the risotto, heat the stock in a medium saucepan over medium-low heat, and bring to a bare simmer. In a large skillet or saucepan, heat the olive oil over medium heat. Add the onion and sauté until it's softened and translucent, 5-7 minutes. Add the garlic and salt, and cook for 1 minute. Stir in the rice and cook 2-3 minutes, stirring constantly, until it's lightly toasted. Pour in the beer and scrape up any bits from the bottom of the pan. Simmer until it's mostly evaporated, 1-2 minutes. Ladle 1 cup of the warm stock into the rice mixture and simmer until it's been absorbed, stirring frequently. Add the remaining stock, 1/2 cup at a time, allowing the stock to be absorbed into the rice before the next addition. Continue to stir often. The total cooking time should be 25-30 minutes. Along with the last addition of the stock, add the corn. Though risotto is traditionally very loose, this one should be a bit thicker, so it can be used to stuff the peppers. Remove the risotto from heat and stir in the Monterey Jack cheese and 3 tablespoons of the cilantro. Taste and season with additional salt and pepper if necessary. Carefully fill each chile with the risotto. If the chiles tear or rip, it's no big deal - they'll still taste great. Arrange the stuffed chiles in a single layer in a baking dish and sprinkle with the queso fresco. Bake 10 to 15 minutes, until golden-brown on top. To serve, drizzle the chiles with the lime crema and sprinkle with the remaining tablespoon of cilantro. P.S. I have the same plates - love them!! I need this recipe in my life, or on my refrigerator now! This looks amazing, thanks for sharing! These sound amazing! So much goodness going on. teeth without the help of plano sedation dentistry you can have to become successful in your dental procedure. This sounds like such a perfect stuffed pepper!! Yum! I cannot wait to make these!! They look amazing! what a great twist on stuffed peppers! love it! Yum! I love stuffed peppers... I've never used risotto though. Great idea to add the beer as a further Mexican twist. I love fusion food. Thanks for the recipe! What I want to know is how I've flipped through the SK cookbook five million times and have somehow never focused on these! Amazing.